Our mission is to preserve and promote California's First Horse. 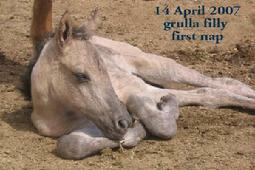 This silver grulla filly's maternal grandsire is Ron Rubidoux's Chance. Silver has 3 full siblings, so we now have four offspring that combine the Chance line from the maternal side with Santiago as sire. Chance is arguably the most famous of this particular CHS strain (though decades before Chance, many of this same strain became foundation stock in the Spanish Mustang Registry). A photo of Chance has been made famous via multiple publications, making him a celebrity. 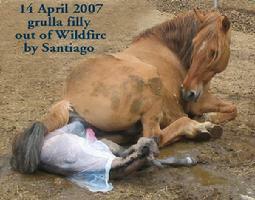 However, Santiago's line, as demonstrated across a variety of mares, has proven to be far better than the Chance line, therefore we will not breed the two Wildfire offspring that show the strongest similarities to their maternal grandsire Chance, as they are tempermentally less suited to human-horse bonding. Instead we will focus our breeding program on the offspring that reflect their sire Santiago's calm, affectionate temperment. Vaquero Silver and Quicksilver take after their sire Santiago, and therefore they will be bred (to carefully chosen stallions) to continue the Santiago-Chance line. Mithril is too "Chancy" and therefore will never be bred, and Silver Eagle was gelded at six months, as he was already demonstrating the aggression inherited from the Chance line. Post-gelding and with careful handling and training, he is growing to be an outstanding gelding and representative of his breed. Isabella and Iberia, out of non-Chance mares, also reflect their sire Santiago's good temperment, and will be excellent breeding prospects to further preserve his excellent bloodline.